Cost of Living in China in 2019 - How Much Does It Cost to Live in China? In the last part we will try to answer the fateful question “Is it expensive to live in China?”, comparing the cost of living in Shanghai with that of Rome, Madrid, London, New York City, Los Angeles, Bangkok and Hanoi. The cost of living in China depends on the city in which you live (Beijing and Shanghai for example are much more expensive than secondary cities such as Chengdu or Kunming, which in turn are more expensive than smaller cities and countryside) and your lifestyle (if you like drinking whiskey and cola in the elegant bars of Shanghai and buy extra virgin olive oil at the City Shop you will spend more than those who shop at Perry’s – a bar for students on Huai Hai Road where a bottle of Tsingdao beer will cost you 10 Yuan – and those who only eat Chinese food). Expect to pay at least 2,500-3,500 Yuan a month for a room in a shared apartment in Beijing or Shanghai (at least if you don’t want to live in the deep peripheries). In other cities the rent is much more economical but it depends on the individual case. You’ll also have to pay for electricity, water gas and internet. According to our data you shouldn’t spend more than 400-600 Yuan a month. The expenses are for the entire apartment so if you live with others you should pay just a portion. Take the survey and help us to calculate the cost of living in your Chinese city! How do you gather and work out the data of the cost of living in Chinese cities? We gather the data through this questionnaire, which we ask to be filled out from our readers who live in China. Each time a reader fills out the questionnaire, the data is automatically updated, making the average of all data that has been sent in available. Why do you only offer the cost of living in four cities? Because at the moment these are the only cities with enough data to calculate a “real” average. Little by little when we receive more data, we can add new cities. How much money do I have to earn to have a decent standard of living in China? This is a very common question but it’s also very difficult to answer since it not only depends on the city in which you’re living but also your habits. To get deeper into this subject, I recommend you read the section of this article “Monthly costs (profiles)”. The cost of living is relatively low, although it greatly depends on your lifestyle. Prices are reasonable and you can get by comfortably with a low salary. Living in the most modern cities such as Beijing and Shanghai is almost twice as expensive as living in smaller cities such as Qingdao, Dalian or Jinan. What is the average monthly salary in China? The average monthly salary in China varies from one city to another, but in general, it can be appealing, even in the worst-rated cities, even exceeding that of some European cities. Shanghai is in first place, with an average monthly salary of 1,100 USD, followed by Beijing with 980 USD and Shenzen with 930 USD. The cost of living changes quite a bit depending on the city, and China does not have a minimum wage established for the entire country. This task is delegated to local governments, because of which each province, municipality or region establishes its own minimum wage based on its specific conditions. How much does a meal cost in China? It depends on where you choose to eat. A simple breakfast costs around 10-20 RMB in the majority of cities, and can even be cheaper than that. Lunch or dinner can cost from 10 RMB to thousands. The price of a combo with a hamburger, fries, a drink and fried chicken costs around 40 Yuan (6 USD). Do you tip in China? 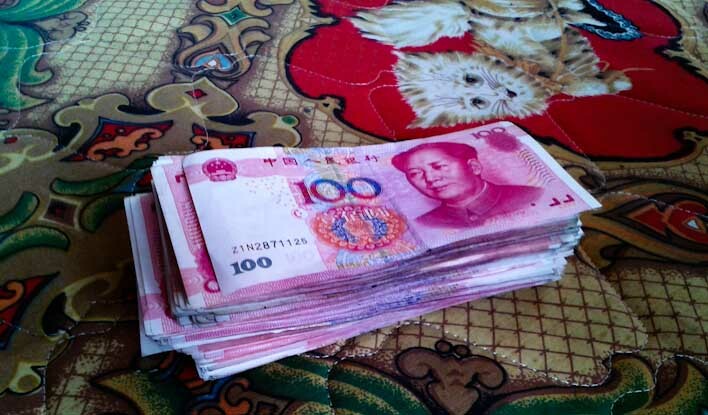 Tipping is not a common practice in China or a part of the culture. People are not used to leaving tips. In the tourism sector, because people are in contact with international travelers, it’s possible that people will expect a tip as a way of thanking them for the service provided. In any event, it is still optional. Our intention is to gather data on the cost of living – and salaries – of all large Chinese cities. When we have enough information we’ll be able to publish statistics not only on the cost of living in various Chinese cities, but also in the quality of life (economically speaking, or rather the relationship between expenses and salaries for the most common trades among expatriates). Click here to fill out the questionnaire with prices and salaries about your Chinese city!